The pumps of the TITANO series are designed and manufactured according to API 674 and ASME standards and cover the range of medium power up to 600 kW. These pumps are studied to guarantee a highly reliable service and to minimize the maintenance operations and the operating costs. 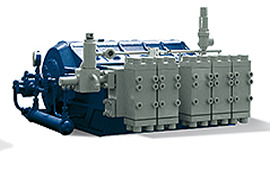 The TITANO series consists of 4 pump sizes in triplex execution. The largest pump of the series (model 31.40) is manufactured also in quintuplex (model 31.40/Q) and septuplex (model 31.40/S) execution, where the same components of the triplex model are used. The TITANO pumps series is particularly suitable for process applications, where heavy operating conditions are met by the conservatively sized crankmechanism. In the triplex pumps the crankshaft is supported by two roller bearings while in the case of the quintuplex or septuplex pumps intermediate bearings are provided. TITANO series pumps normally do not require an auxiliary lubrication system, as the standard execution foresees a simple and safe hydrodynamic lubrication that allows high reliability with low operating costs. Widely proven hydraulic solutions are available and are the right path for solving the problems connected with high pressure, high or low temperature, products difficult to be handled (toxic, corrosive, explosive and abrasive fluids, liquefied gases, slurries) conditions that are often present, even jointly, in many applications. The standard liquid end of TITANO pumps consists of a manifold provided with flanged connections and one independent valve body for each plunger. This construction allows for easy maintenance, since the disassembling of each valve body and cylinder is allowed without disconnecting the suction and discharge lines. The valve bodies (complete with valves and seats) and the hydraulic cylinders (complete with stuffing box packings and plungers) can be pre-assembled at the workshop minimizing on site work and downtime of the pump during replacement. The solution with independent valve bodies is also particularly suitable for applications where significant temperature fluctuations are expected, as the consequent thermal expansions are symmetrically distributed and absorbed by each single body. Various types of valves are available to meet the NPSHa conditions and the characteristics of the different fluids handled in terms of viscosity and solids content. Furthermore, Peroni studied many sealing systems and the design of each of them is suitable to solve the problems connected with the physical characteristics of the fluid handled and the risks connected with its contact with the atmosphere.